Choosing the right marketing automation tool can be an overwhelming task. We’ve identified solutions that work great for small businesses and solopreneurs. Today we’re sharing with you an ActiveCampaign review – the main features, the hidden secrets, what we don’t like, what we do like and some things that we find useful too. Make sure you read our ConvertKit review too if you’re considering these two tools. There are some similarities between the two software solutions – this is why a lot of people are struggling to identify the right one for their business. 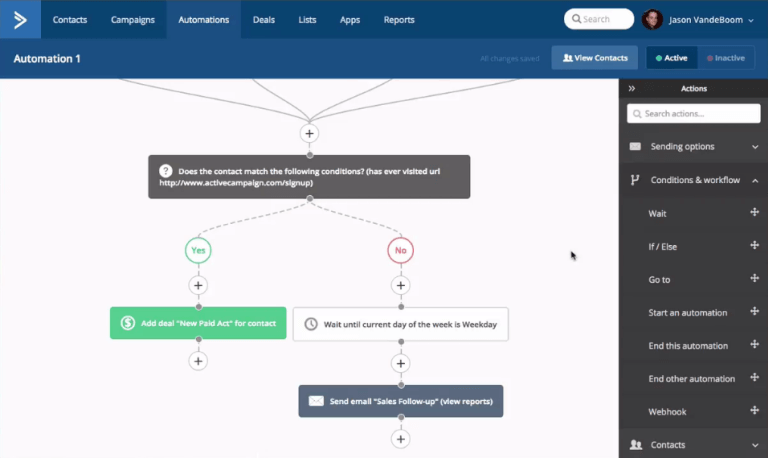 ActiveCampaign offers marketing automation at the lowest price on the market. You can start with $9/month and grow confidently. It’s a prefered tool by a lot of bloggers, coaches, and consultants as it revolves around email marketing, CRM capabilities and handling Deals (instead of sales). 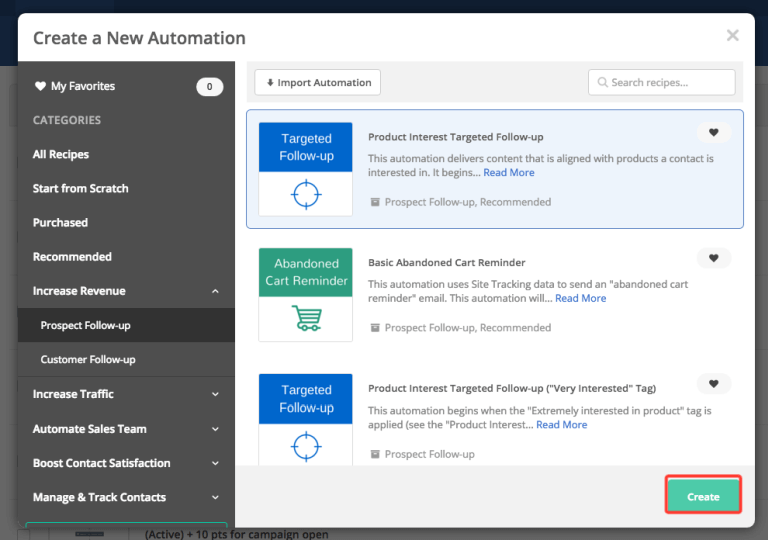 With the now built-in integration with WooCommerce and great marketing tracking, this tool should definitely be on your radar if you’re shopping for email marketing software. ActiveCampaign strikes us as a straightforward to use tool, not too complicated at all. That has its limitations, but if you’re just getting started with marketing automation, go with it. 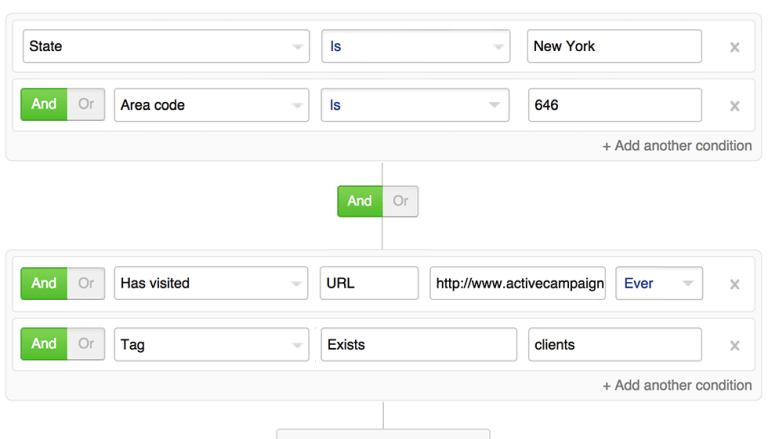 The latest Attribution feature allows you to see all steps that a contact has taken before converting. You’ll have a visual map of not only the first and last marketing source, but all the in-between events. That would help you understand your marketing budget better and invest where it really makes sense. Now, let’s dive into all the main features and how they could be helpful to you. ActiveCampaign is what I call a hybrid contact management system. It is built around lists, but looks and works as a database. You have the opportunity to create one main Master List and use it for most of your campaigns. But you can also choose to create separate lists for your segments – if you decide you need them. One of the main identifiers for contacts in advanced database systems are tags. Tags are like labels – a single contact may have more than 1 – even more than 100. It’s tags that make these systems go round and track user’s activity and interactions. For people coming from MailChimp tags are usually confusing. With a tag-based database you can create multiple lists of people (called Segments) based on the combination of labels they have or don’t have. This allows you to go deep into the rabbit hole! Contrary to MailChimp, if you use one Master List for all your contacts in ActiveCampaign, you can see the overlap between their interests. And interest-based content is what marketing automation is all about. This is the way you can get the best result – by delivering the right content to each person based on what they’ve interacted with. Yes, you can still manage your contacts using lists. Each optin form would require to be assigned to a list. But a single list can here be used to manage different brands and companies under the same account. Keep in mind that your contact information in the footer of the emails will always be the same. Combine these lists with the power of segmentation based on tags and you’re looking into a very powerful system. Something that I really enjoy in ActiveCampaign is their Social Profiles. The system will try to identify each contact based on their email address – and provide you with their social accounts and/or avatars. If you’re a coach/consultant or have a direct sales team, this is extremely valuable. Putting a face to the name (or email in this case) will give you a better understanding of the prospects social behaviour and interest. I’ll let you dream about the possibilities here for a second. Sometimes the basic fields are not enough – more often than the opposite. 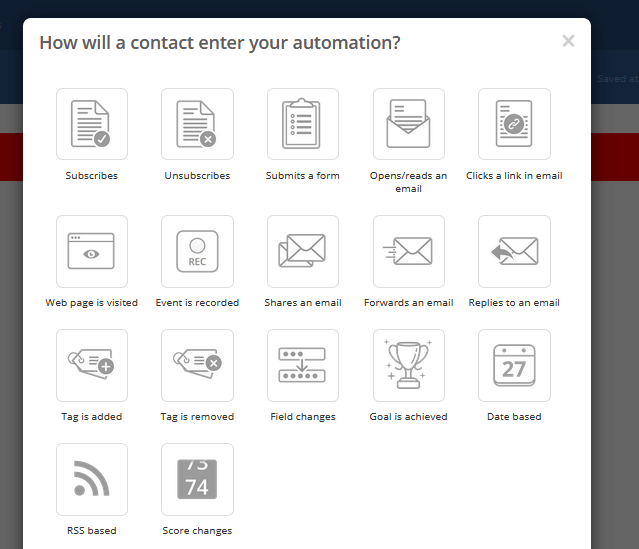 ActiveCampaign promotes they allow you to create unlimited custom fields for the contact records. That would allow you to track responses on short surveys, specific dates that are important for your business, etc. Most importantly – you will use these custom fields in your automations – making it easier to personalize the content you’re sending. Note: These fields are list-specific, so if you are using more than 1 list, you need to duplicate them there. A rule of thumb is to avoid naming them in the same way in this case. Use a naming convention that will allow you to see which list they belong to in the drop-down menus. Email marketing thrives on opt-ins. And forms are the most versatile and important part of them. ActiveCampaign has an easy to use, visual drag-and-drop form editor. There is no limit to the number of forms you can have in the system. If you’re currently a MailChimp user, you’ll find this a great feature. There is also a WordPress plugin available for you to publish the forms directly on your website. ActiveCampaign is one of the tools (together with Drip) that don’t have a landing page builder in their package. You will need to use an external service to create and manage them. You can choose between tools like ONTRAPAGES, LeadPages, ClickFunnels, etc.. Here ActiveCampaign is comparable to ConvertKit – there is no limit to the number of emails you can send on a monthly basis. This is great when your list grows and you want to do a major launch with a big number of emails. You don’t get to worry about extra costs and keeping your emails under the quota. What I see as an issue here is that you might get too excited with the unlimited number and start spamming your contacts. Please don’t! You can have as many segmentation rules as you need. Good set of templates. Drag-and-drop editor, also you can “start from scratch” and paste HTML template from other sources. Templates are kinda image-heavy and look like a classic newsletter. 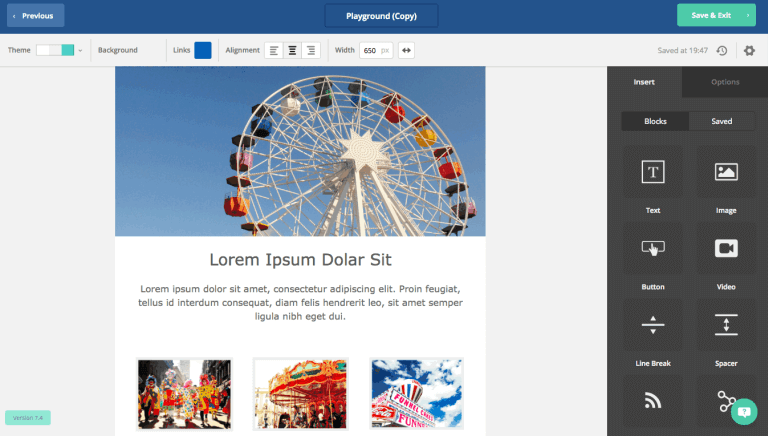 Drag and drop email builder – easy to create beautiful templates and customize them. Note that saved emails are not “globally available” – i.e. they are linked to the specific automation/campaign. You can use “sent campaigns” to recycle old emails as content/design but new automations show “no email available, create one” and no emails from other sequences are shown. One of the great features that ActiveCampaign supports is conditional content. You can show or hide specific email elements based on the contact’s tags. We use this for upsells and downsells, when we want to show or hide a specific group of products. It’s a great way of promoting different offers in your newsletter depending on the products that were previously purchased. If you do this, a customer that bought product A would see an offer for product B, instead of product A again. When you want to send a once-off message to your list (or a segment), you need to create a campaign (a.k.a. Broadcast message). Choose one of . Reply tracking – the system will log when a contact responds to your email. Very powerful feature. Google Analytics support – all links would be automatically tagged with UTM parameters so that you see the related traffic within Google Analytics. RSS functionality is included by default. Your marketing campaigns are managed from the Automations tab in the top navigation menu. Think of an automation as a stream of events that are happening to a contact. Much like Drip and ConvertKit, you have one line of action per automation. If you want to see more activities on a single map and track the stats of the whole marketing campaign, you’ll need ONTRAPORT. What makes ActiveCampaign different than ConvertKit and MailChimp is the types of elements you can have in one drip campaign. 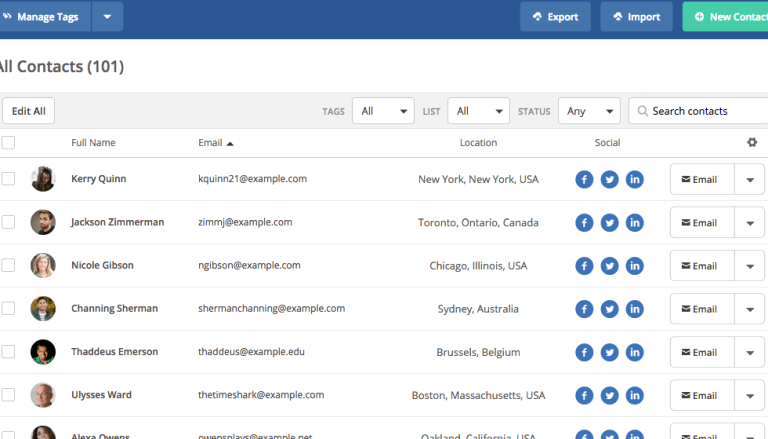 Where the other 2 tools only allow for email messages to be sent, here you can add segmentation points, time delays, move people to another funnel, track their activity on your website, check for tags… A lot of things actually. That’s what makes ActiveCampaign a better tool according to me. You have a set of templates that you can use to kickstart your automations – delivering free content, lead nurturing, re-engagement, selling, follow ups, etc. If you’re not confident you can come up with the whole solution by yourself – just use one of the templates for a start. Then you just need to customize it based on your plan and goals. Standard drip sequences of emails can be set to wait for an X amount of weeks, days, hours, minutes before delivering the next message or step. This makes it more flexible than ConvertKit as you can send urgency reminders when your offer is about to expire – not just the same time every day. Date sequences, which we love here at Buzz Fixer, are possible to create but require a bit more clicks to get the right settings. You will need to create a condition that says “Wait until… day/month/year/time”. The issue here is that you will need a separate step for each of those. So in order to send an email on a specific date, like 23rd May 2017, you would need to create 3 separate steps – one for the day, one for the months, and yes – one for the year. On the plus side: these dates/times can be scheduled according to the contact’s time zone. If you have a worldwide audience and want to make sure they get their emails early morning – this is a valuable feature. You can also send date-based emails relying on custom field values like subscription date, creation date, expiration date, birthday, etc. ActiveCampaign has only in-sequence rules. There’s a set of automation templates you can adapt to your needs. Almost all possible scenarios are covered. Plus automation marketplace. A big plus is the CRM/Sales automation functionality. It is available only in the Plus account and the other higher-level price tiers. You can use it to take action based upon where is the contact in the user journey, and trigger actions based on when they purchased, for example. You need to pay $49/mo to use this feature so it’s probably best to keep it as option when your list grows and you need the additional features. Visual campaign map with info for every contact where he is in the automation steps. This makes it easier to grasp the structure of the funnel and removes the need for external funnel mapping that is required for Ontraport for example. 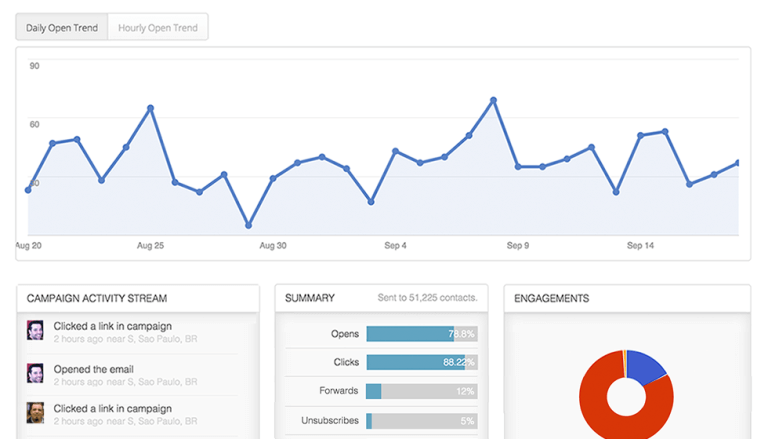 ActiveCampaign has a very detailed reporting section, unlike ConvertKit. It can be quite overwhelming if you don’t know what you’re looking for. My advice is to have pre-identified KPIs to follow and not review every single stat available every time you send an email. Integrations are available for over 150 apps, full list here. Plus what Zapier additionally provides. No Thinkific and Kajabi, at least without Zapier. No global rules – you need to create sequences to act as global rules, and set according “automation entry point” triggers to include all contacts. No direct payments through the system – you need an external shopping cart like SamCart. Even revamped, email editor is still somehow unfriendly and oh so sloooooow to load. I hope you enjoyed this ActiveCampaign review and are now more confident in your decision. If you’re interested in creating your marketing automation strategy and implementation plan around it, contact us. We have vast experience with the tool and will be happy to help you. Great piece explaining about ActiveCampaign and I’d like to add Aritic PinPoint is a platform with unique features like hybrid multi-channel marketing, one on one targeting with FB ads, that you must take a closer look at.